In a recently published essay review in Studies in History and Philosophy of Science Part A Michael Pettit (above) explores some of the recent work on Cold War rationality. 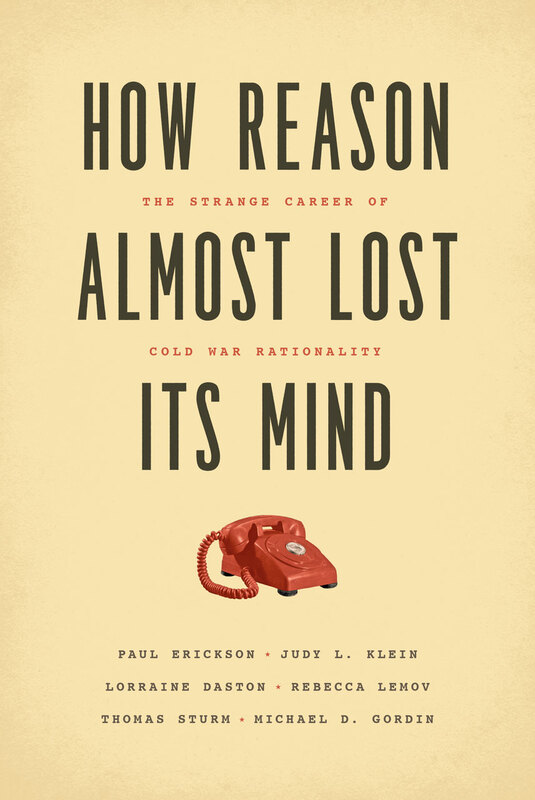 The essay centres on a review of the volume How Reason Almost Lost Its Mind: The Strange Career of Cold War Rationality – written collaboratively by Paul Erickson, Judy L. Klein, Lorraine Daston, Rebecca Lemov, Thomas Sturm, and Michael D. Gordin – in order to explore the broader recent historiography of Cold War social science. Pettit’s argues “that by focusing rather narrowing on intellectuals in their immediate in- stitutions the recent historiography, including the book under consideration, is inadequate for accomplishing its aim of properly situating the Cold War social sciences.” The full essay review can be found(behind a paywall) here. A new issue of Isis, the official journal of the History of Science Society, is now online. The issue includes an article by Jill Morawski (right) on the relationship between experimenters and subjects in postwar American psychology. A special focus section on “Bounded Rationality and the History of Science” also includes a couple of pieces that tackle the history of psychology. Full titles, authors, and abstracts follow below. Since the demise of introspective techniques in the early twentieth century, experimental psychology has largely assumed an administrative arrangement between experimenters and subjects wherein subjects respond to experimenters’ instructions and experimenters meticulously constrain that relationship through experimental controls. During the postwar era this standard arrangement came to be questioned, initiating reflections that resonated with Cold War anxieties about the nature of the subjects and the experimenters alike. Albeit relatively short lived, these interrogations of laboratory relationships gave rise to unconventional testimonies and critiques of experimental method and epistemology. Researchers voiced serious concerns about the honesty and normality of subjects, the politics of the laboratory, and their own experimental conduct. Their reflective commentaries record the intimacy of subject and experimenter relations and the plentiful cultural materials that constituted the experimental situation, revealing the permeable boundaries between laboratory and everyday life. In the United States at the height of the Cold War, roughly between the end of World War II and the early 1980s, a new project of redefining rationality commanded the attention of sharp minds, powerful politicians, wealthy foundations, and top military brass. Its home was the human sciences—psychology, sociology, political science, and economics, among others—and its participants enlisted in an intellectual campaign to figure out what rationality should mean and how it could be deployed. How Reason Almost Lost Its Mind brings to life the people—Herbert Simon, Oskar Morgenstern, Herman Kahn, Anatol Rapoport, Thomas Schelling, and many others—and places, including the RAND Corporation, the Center for Advanced Study in the Behavioral Sciences, the Cowles Commission for Research and Economics, and the Council on Foreign Relations, that played a key role in putting forth a “Cold War rationality.” Decision makers harnessed this picture of rationality—optimizing, formal, algorithmic, and mechanical—in their quest to understand phenomena as diverse as economic transactions, biological evolution, political elections, international relations, and military strategy. The authors chronicle and illuminate what it meant to be rational in the age of nuclear brinkmanship. …‘Forbidden Histories’ implicates the existence of a taboo, and of motivations and sensibilities that have kept it alive. This blog is thus primarily concerned with the functions of popular science and disciplinary history as knowledge management and tries to identify a variety of epistemologies and concerns (many of which, interestingly, have been mutually antagonistic), that have prevented mainstream historical information from entering common knowledge. Obviously, as a historian of science I am neither interested nor competent to decide whether or not some ‘miraculous’ phenomena do in fact occur, and how to interpret them if they do. Rather, the purpose of this blog is to test questions and ideas concerning the historicity of certain standards of rationality – particularly those we are not accustomed let alone encouraged to critically reflect upon, even though they have powerfully shaped western individual and collective identities. To be sure, my blog does not aim to provide easy answers but merely rehearses some of my personal reflections on what it means to be ‘rational’. Well aware that it thoroughly goes against the grain of many established ideologies and epistemological standard positions, all I can do is assure you that it strives to employ those principles that most would agree make good science as well as good history: contextualised evidence and differentiated analysis.